It was our first time trick or treating in the new neighborhood and I gotta say it felt weird this year not doing it with our neighbor like we’ve done for the past several years. It wasn’t the same. Still we had a good time dressing up as our favorite characters and chowing down on candy bar after candy bar when we got home. We let the kids go all in and devour their loot when they got home… then we let that sugar coma set in while we vegged on the couch with a little Charlie Brown and the Great Pumpkin. This year we had Batman and Batgirl swoop in on the bad guys of Gotham City. We now have waaaaay more candy than any household should have in its possession. Happy Halloween from the Circus Fam 2012! For many north of us on the east coast, Sandy was more than an adventure… it was a catastrophe. It was devastation. It was unlike anything I have ever seen first hand or experienced. So, I hesitate to even really blog about our adventure… b/c for us… that’s what it was, an adventure. An escape from the normal day to day living for a few days. A “Staycation” if you will. We heard about Sandy well before she hit MD and we did all we could to prepare. I baked 2 loaves of bread, baked cookies, stocked up on pasta and sauce, washed all of our clothes and dishes, found flashlights and candles, bought water, filled all the bathtubs with water (so we could flush toilets when the power went out, filled pots and bowls with water for the dog, and for cooking, bought paper plates, and Scott did his very best to try and get our generator working. I grabbed my boots and jacket and the kids cute little firefly lantern and raced next door. (Thankfully Scott had already pre run the extension cords from the sump pump to the outside incase he had gotten our generator working). When I raced back to say they said yes, he took off to plug it in and I started bailing. I made 2 bucket trips outside while he was plugging in and my back was already sore. I can not imagine if we hadn’t been able to plug in. After plugging in, Scott brought our gas cans to our neighbor and we settled in for the night. Once the sump pump was working, we were really fine. We enjoyed meatball sandwiches and salad by lanternlight for a late dinner. The kids went down rather easily… the big 3 wanted to have a sleep over in one room. Scott and I settled in to read books down in the guestroom (which is conveniently right by the sump pump) and all was well. As the winds picked up, I decided I felt safer having everyone sleep downstairs, so we brought the kids to the basement and settled in for the night…. reading and then being lulled to sleep by the sound of our sump pump working. In the morning, Scott checked in again with our neighbor and since he had plenty of power, we were able to plug in our coffee pot as well. Priority Number 2 after the Sump Pump. We then took a look outside and a walk down our street to check out the hood. The backyard looks like a swamp. Ever wonder what inches of rain falling down in 24 hrs looks like? We also lost 2 of our pear trees in our front yard. We expected this. We all took time to pray and thank God for sparing the third tree. The kids have deemed it the “climbing tree” and we had been fearful it wouldn’t survive the storm. After lunch, we decided to take the kids to Annapolis to see if we could see some high water. Here is the dock across the river from the Naval Academy. Here is where I discovered there are holes in my favorite whale rain boots. As I walked back on the dock, I could see water spraying out the sides with each step. Major bummer as I loved these rain boots. The kids had such a fun time running around in the water. Until they didn’t. Then we raced back to the van, stripped off their clothes, cranked up the heat and went home to snuggle in blankets and drink hot cocoa. Like I said… for us, it was an adventure. A mini stay-cation. We camped out on the floor. We ate dinner by candle light. We didn’t lose anything… except the chance to take a shower. And now, after about 40 hours, our power is back and life goes back to normal. We were very, very fortunate. Some days we wake up on “school at the building days” with clothes all lined up and ready the night before, I’ve gotten lunches packed complete with notes from Mom, and we’re out the door on time so we can arrive at the building with plenty of time to drop everyone's books off in their classrooms and report to the sanctuary for opening with time to spare. Which morning do you think it was when we had class pictures in front of the building at 8:30am sharp? As much as I hate the cold, I really am a 4 seasons kind of girl. I love the beginning of a new season…. bringing out favorite clothes, decorations, foods, traditions only enjoyed for a season. It’s refreshing and exciting and makes me so grateful for the climate we live in. But, this year, more than most I have been crazy excited about fall. I can’t explain it. But, I’m more giddy than normal about pulling out my jeans and boots and sweaters. I LOVE my fall decorations and am burning my pumpkin spice candle every waking second I am at home. Last week we enjoyed one of my favorite fall traditions… apple picking! I love apple picking and this year I think was my favorite year of it. (of course the bar has been set pretty low the last 2 years…. we had the porta potty incident of 2010 and then the whining/disobedient frustration of 2011—which didn’t make the blog). So, really it could only go up from the last 2 years. The weather was gorgeous. The kids were agreeable (the KEY most important ingredient for a successful Mom and kid outing). And every one got to participate this year. I was all kinds of smiles snapping pics of my little apple pickers. Not only did I come home with around 40lbs of apples, but I even got a decent picture of all 4 kids! What more could a Momma’ heart ask for? Because potty training is a lot of work. It takes time and patience and flexibility. While it is great to emerge on the other side with a child who no longer needs diapers, the process of getting there is, in my opinion, no fun. But, today while at Target for more diapers b/c he was wearing the very last one I could find in the house (as in I had already scoured the van, all the bathrooms, and dug this one out of the corner of the closet.. very last one), we stumbled down the underwear aisle and the kids found “choo choo” undies which he of course got so excited about. I bought them b/c I knew they would be great incentive for the day when we started potty training. But, I also pot a box of diapers b/c I wasn’t yet sure if that day was today… and plus, come on, it takes awhile to emerge on the other side. We got home and he eagerly pulled out the choo choo underwear. I told him he had to go potty first. Look at him looking back to check out his work. And then he proudly points to it showing me how he went potty right there. When he was done he raced out to put on his underwear. I explained that he can’t pee pee on the choo choos. If he pee pees he has to go on the potty or a diaper. So, he ran back to go on the potty more time. Oh my it was soooo precious. I guess it’s time to hop aboard the potty train. It seems to be leaving whether I am ready or not! I was scrolling around on pinterest one night and a graphic caught my eye that made me stop in my tracks. 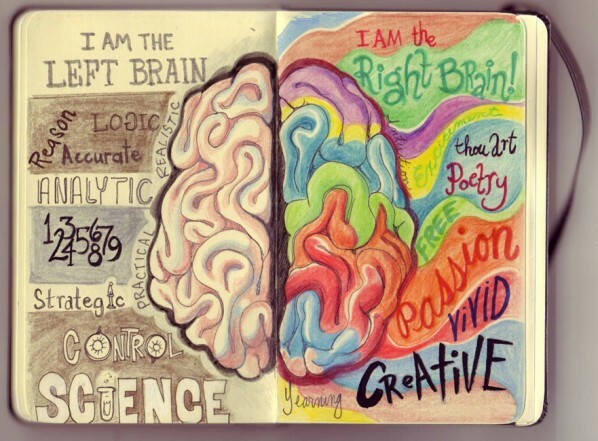 It showed 2 sides of the brains and listed descriptions for left/brain right brain people. I think often people are largely a little bit of both. However, when I looked at this graphic, it was like a portrait of my daughters. 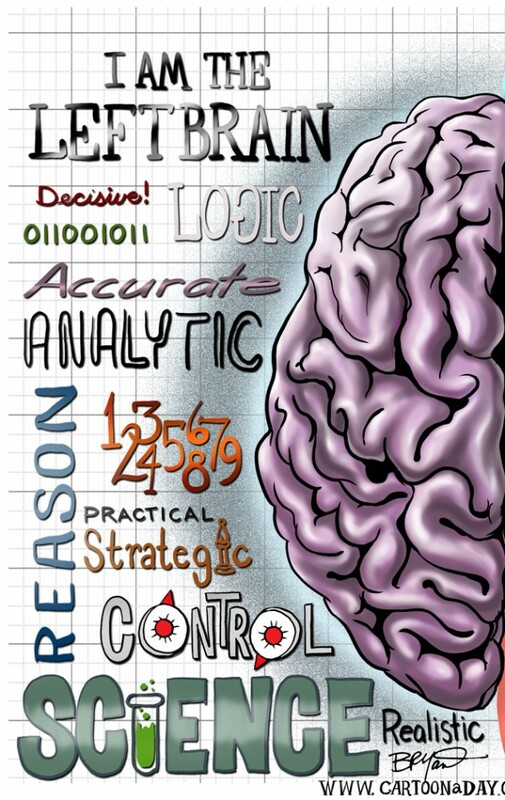 I swear my 6 year old could be the poster child for the left brained person. 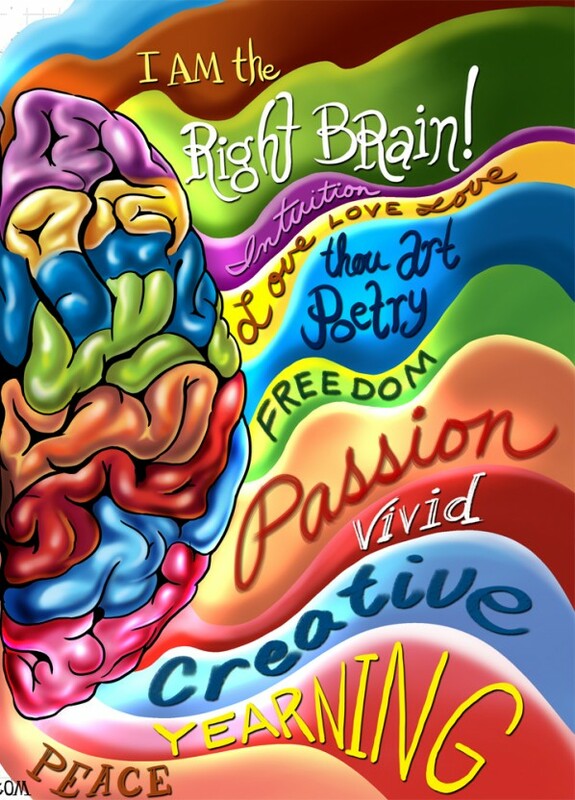 And equally astonishing to me was the fact that as I looked closely at the adjectives for the right brained person, I found my 5 year old fit it TO THE TEE! As I think back to the post I did this summer describing her personality… this was her. I am astonished that both girls could be SO DIFFERENT. While my boys appear to be more blends of both, my girls are quite distinct in their personalities. I see it in the way they organize their stuff, they way they dress, they way they keep their rooms, do their school work, even do their gymnastics. I found it interesting to read up on both personalities and learn more about the strengths and weaknesses of both. To be sure, I can’t parent them exactly the same way. Given that they are a grade a part in school and only a year and a half apart in age, they share a lot of their life together. I think it will be good for them to have their own distinct identities and I hope they will learn to work together with someone completely opposite from them. They have no choice since they share a room/dresser and sometimes bed with each other.